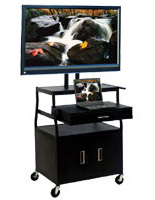 Mobile AV Cart is Perfect for use in a Classroom Setting. This Audio Visual Trolley Has a Flat Screen Mounting Bracket. This Mobile AV Cart is Functional! Holds the majority of flat screens up to 32" weighing less than 70 lbs. Constructed of durable steel for a long lasting cart. 4 swivel caster wheels with two locking for an easy to move display. Extendable pull out shelf for holding laptops or other presentation equipment without interfering with the view of the screen. Adjustable height cart from 26"-42" in 4" increments to suit the special needs of the user. This Mobile AV cart that includes a flat screen mount is powder coated black to fit with nearly any décor and furniture. 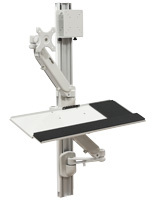 This plasma mount trolley is height adjustable from 26"h to 42"h with 4" increments. This plasma trolley, Mobile AV cart that has swivel wheels is simple to move and can be locked into place once in a desired location! This stand comes with a 15' UL listed power cord with a 4 outlet power strip and surge protecter and cord winder. 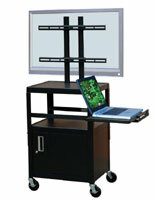 This Mobile AV cart that has a laptop shelf is ideal for presentations in a classroom or office setting. This plasma display has a flat screen mount which includes a security screw that connects the screen to the poles. This Mobile AV cart can hold up to 32" monitors weighing up to 70 lbs. 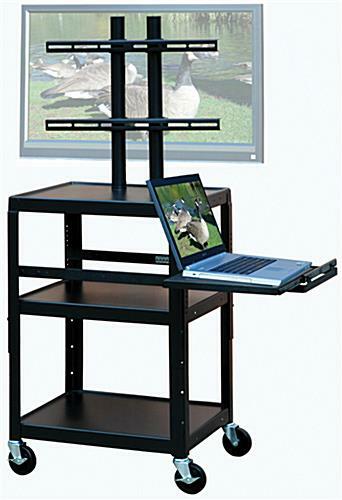 This workstation is ideal as an educational cart for classrooms. Business can also find this Mobile AV cart useful for business meetings. This display can be wheeled from room to room. This Mobile AV cart includes posts with a wiring hole to keep cables hidden. This display is constructed with black powder coated steel. This steel Mobile AV cart is durable and can withstand long term use! 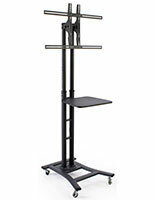 This mobile workstation for a plasma screen includes shelves to hold other equipment or presentation materials. 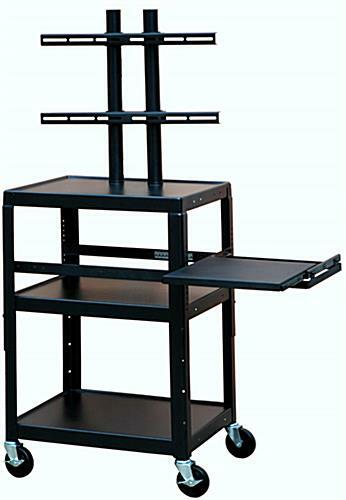 This mobile Mobile AV cart, also known as classroom furniture, has (3) 24"w x 18"d shelves. This audio visual furniture has mounting posts measuring 23-1/3"w x 20"h. Manufacturer model# FPC4226E.